St. MARTINS BREWERY Lot No. 8 (as George) advertised for sale 11th October 1794 ? Relocated to different premises soon after September 1865. Convicted 05.01.1918 for selling out of hours. The accounts of bankrupt William Poll or Paul were published Saturday 8th February 1862. His obligations were £187 17s 1d with good, bad and doubtful debts at £47. Being unopposed he was discharged. Offered for sale May 1784. Described as a good accustomed Drawing-house, with Garden and Stable, let to Charles Weston Esq., Tenant at Will, and a Barn, a Stable and several substantial new built Tenements with small Gardens to same. Recorded as the GEORGE in 1789 & 1794 Registers. Lot no 29 in sale by auction 14th to 17th September 1841 of the Coltishall Brewery. Copyhold sold to Mr. Shaw for the sum of £380. 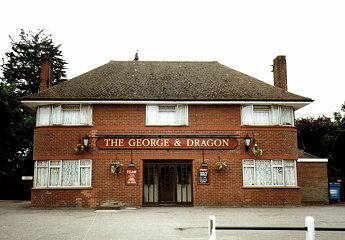 At the Annual Licensing Day, 2nd September 1865, the licence of the GEORGE INN, Catton, was not applied for since the house was soon to close. The 1884 OS 1:2,500 series map shows the house at its new premises on School Road, Sprowston. Building of new premises in School Lane, Sprowston commenced 1938, apparently behind the premises shown 1884. Completion of building 1939 said to have increased the value of the house by £2470. The (spirit) licence of the ADAM & EVE, Carleton Rode was removed 10.05.1938 and the Beerhouse licence (of the old house) was surrendered without compensation. In return a full licence had already been granted for the new house. The reference above to Bullards stems from the fact that in 1984 many Bullards artefacts were in evidence, including an ironwork silhouette depicting the `new style' logo, which was then mounted near the entrance.